On the afternoon of April 13, after the last heavy air raid on Hamburg, a telephone call came through from the command post ordering me to return to Hartzwalde at once. I was told that Himmler intended to take action. The car placed at my disposal broke down, and the repair delayed our departure by a day. On the evening of April 14, we left Hamburg, running into a heavy air raid at Boizenburg. A great many trucks had been knocked out and were scattered all over the road, together with many dead and wounded. We only just managed to escape harm by driving our car under some trees. Early on the morning of April 15, we arrived at Harzwalde, where the manageress of the estate handed me a secret report and told me to prepare myself for an important conference which had been convened at Schellenberg's request. (5)	Generalfeldmarschall Ferdinand Schörner, born June 12, 1892, at Munich. My astrological calculations were very difficult and I worked constantly, breaking off only to receive telephone calls from the command post and from Himmler's headquarters. Then, on April 18, Felix Kersten telephoned from Stockholm to say that he was setting out for Hartzwalde at once with Storch. I had already heard rumors that he might bring the Jewish leader to Germany for further negotiations. April 18 was a particularly exciting day because I also learned from friends of mine in Department VI that the SS leaders, including Schellenberg, Dr. Brandt, and of course Himmler, intended to flee to southern Germany, fighting their way through if necessary. This was the "Obersalzburg plan," the details of which were revealed after the war. Himmler wanted to be near General Schörner's army, which was still intact, and I was supposed to accompany him on this trek. If I refused to go, I was to be put in chains and forcibly removed. I was deeply anxious about this proposal because the whole project was ill-conceived and ran counter to my astrological forecasts. I was now required to investigate the problems posed by the Obersalzburg plan; this task kept me occupied for some time. Meanwhile, on April 19, Felix Kersten arrived at Hartzwalde accompanied by Herr Masur. Instead of coming to negotiate with Himmler himself, Storch had sent Norbert Masur to represent the interests of the World Jewish Congress. Masur came from a Hamburg business family who had left Germany in 1938. Kersten and Masur had flown from Stockholm to Copenhagen in a Swedish plane and had then transferred to a German plane for the second leg of their flight to Berlin-Tempelhof. In his memoirs Kersten stressed the significance of this perilous journey and the risks involved. Since Kersten was not particularly heroic and was very frightened of the Russians, this journey of his really was rather remarkable. He would scarcely have undertaken it if the Swedes had known just how far the Russians had advanced on Germany's Eastern Front; Kersten was unaware that Russian troops had occupied a number of Berlin suburbs. Masur's journey to Berlin and Hartzwalde was treated as top secret, for if Himmler were denounced, Bormann or Hitler might then intervene and have Masur arrested. Masur was to travel incognito. Himmler's personal physician, Dr. Brandt, had made out a special identity card for him, which also guaranteed his safe return to Stockholm. Masur had been authorized by Storch to enter into personal negotiations with Hirnmler on the agenda drawn up by the World Jewish Congress. Felix Kersten and Norbert Masur reached Hartzwalde in the late afternoon. Earlier that morning there had been a heavy air raid on Oranienburg. Large areas of the northern suburbs of Berlin had already been destroyed, so that on their journey they passed through street after street of smoking ruins. Most of the roads were so blocked by debris that their vehicle-one of Himmler's personal cars which had been supplied by his motor transport section-had to make extensive detours and arrived very late. This was the first time that Masur-and probably Kersten as well-had ever seen such a panorama of horrors. They arrived in Hartzwalde frightened and exhausted from their unnerving experience. Masur, a small, slender man with a narrow head and intelligent eyes, had turned pale green and stood looking at us in horror. When I greeted him, he was speechless. Kersten had also lost his fresh complexion, but he recovered quickly and asked if Schellenberg had arrived. Kersten's sister Elizabeth and his secretary then took the visitors' luggage. After they had recovered, Kersten introduced me to Masur. I was not, of course, presented as Himmler's astrologer, but as a "Sanskrit researcher," in accordance with Himmler's general instructions. I was embarrassed because of my ignorance and tried to rectify matters by referring to myself as a "student of Sanskrit," for I was far from being an expert. Meanwhile, darkness had literally descended, for as a result of the heavy raids on Oranienburg and Berlin that morning, the power and transformer stations and large sections of overhead cable had been destroyed. We sat without light or radio. Only the A-Leitung (direct telephone line) to Himmler's quarters was still in working order. Sleep was out of the question. Masur opened the conversation with an account of his impressions of the journey from Tempelhof to Hartz-walde. He was still very shaken by the terrible scenes he had witnessed. He looked first at Kersten, then at me, and said, "Gentlemen, we"-by this he meant the Jews-"are all square with the Germans. We shall not try to take our revenge. The Nazi regime was a very bad investment for Germany." Kersten had already told me that Hillel Storch held similar views. But the conversation never really got going. I had been ordered to keep, and Kersten was waiting tensely for a telephone call from Himmler's headquarters. Schellenberg had sent a message saying that he would arrive that afternoon and wished to consult me on certain astrological matters before the discussion. But he did not arrive. At 2 A.M. on April 20, Schellenberg finally arrived at Hartzwalde. The ensuing discussion was held by the dim light of candles. Kersten immediately took Schellenberg aside and showed him his agenda and the requests from the Swedish government for the release of individual prisoners. Schellenberg seemed exhausted and spoke very little. He had not slept for days. I withdrew so as not to disturb him and Kersten. Subsequently I learned from Schellenberg that he had been very angry about Kersten's demands. Kersten said very little about this conversation, but I gathered that the Reichsführer was not prepared to grant any large-scale concessions to the Swedes until a date was fixed for a meeting between himself and Eisenhower. Himmler's personal situation was very precarious, and events were beginning to snowball. Schellenberg tried to convince Kersten that it was in Germany's interest to persuade the Swedes to grant the German forces stationed in Norway transit rights across Sweden so that the Eastern Front could be reinforced. After that the conversation soon came to an end because Schellenberg was very tired and went to bed. The next morning Schellenberg was introduced to Masur. Masur then stated his requirements, and Schellenberg agreed to them under certain conditions. But their discussion was interrupted in an unexpected way by two violent explosions. Although very few visitors to Hartzwalde were aware of it, there was an ammunition depot and a bomb disposal unit close to the estate. The fear on the faces of Kersten and Masur when the explosion occurred was something to be seen; they thought the estate was being attacked! All that was happening was that the bomb disposal men were dealing with a few fairly small unexploded bombs. Meanwhile, from the direction of the Oder bridgehead came the rumble of cannon. Schellenberg told me that he had had no desire to join in "the madman's" birthday* celebrations and had preferred to come to Hartzwalde. Later, he said, he had to go on to Himmler's headquarters at Wüstrow and he asked me to answer some of the questions the Reichsführer had asked. In addition to the inquiries about Borrnann, SeyssInquardt, Schwerin von Krosigk, and Schörner, Himmler wanted to know when Hitler was likely to die (this was a matter of great concern to him); whether Himmler would succeed in bringing about an armistice; whether there would be any military activity in Hartzwalde and, if so, whether this would be due to the proximity of the ammunition depot; whether the people at Hartzwalde should be evacuated; astrological profiles of SS General Erich von dem Bach-Zelewski, Von Alvensleben, Waltenhorst, Professor Kurt Blome, and Balder von Schirach. *	Hitler's birthday on April 20. When we had finished talking, Schellenberg and I went down to the study, where we found an extremely agitated Kersten. The day before, Dr. Brandt had been informed that the negotiations with Masur would be conducted on April 20, but since then there had been no further news, and we still did not know for certain whether or when Himmler would arrive. Kersten was furious when Schellenberg mentioned the possibility of a meeting with Bernadotte. "What a fool I am," he said. "I arranged the meeting between Bernadotte and Himmler, and now all I can do is sit here and wait!" Masur remained in the background and kept very quiet. I found the atmosphere wholly uncongenial and retired to my room to get on with my work. Just before two o'clock on the morning of April 21, Himmler arrived. He talked first with Kersten in private. Himmler wanted to know whether the Swedes would allow the troops stationed in Norway to pass through their territory. This project had been under discussion for weeks. Kersten was supposed to have taken it up in Stockholm and to have used his connections to influence Gunther, the Swedish Foreign Minister. But the Foreign Minister had rejected his request. The Swedish government was prepared only to intern the German troops stationed in Norway, not to grant them transit rights. And so Himmler had lost out again, for only Hitler could order the troops to lay down their arms. At this stage the military consensus was that any troops that could be spared from Norway, Denmark, and Holland should be withdrawn as quickly as possible and sent to the Eastern Front. But that military genius, Adolf Hitler, held a different view. His orders were to stand firm. Not a yard of ground was to be given up. *	The meeting had been set up by Kersten, at Schellenberg's instigation, when Bernadotte had visited Nevengamme concentration camp to arrange for the feeding and evacuation of the prisoners. At the end of his talk with Kersten Himmler said, "Perhaps there will be a change of leadership soon." That night there was another heavy air raid on Berlin. From the balcony of the house in Hartzwalde we saw the city burning in the distance. Thick black clouds interlaced with spirals of smoke rising from the exploding bombs could be seen on the horizon. However, it sounded as if a few of our antiaircraft batteries were still firing. All this time Masur had quietly waited. Then Himmler, who had butchered more Jews than any man in history, held a secret meeting with a representative of the World Jewish Congress to negotiate the release of Jewish prisoners and discuss the chances of an armistice! Masur remained cool and withdrawn. During the course of the evening Himmler had to promise Herr Masur that he would not carry out Hitler's orders to have all Jewish prisoners in the concentration camps exterminated. He kept his word and released the majority of prisoners on Kersten's list, insofar as they could be traced. Moreover, Himmler had no more Jews exterminated. He is supposed to have said to Kersten at the end of this discussion, "The best people in the nation will perish with us; those who are left are of no interest to us! The Allies can do what they like with those who are left!" At dawn Himmler and Masur walked in the fresh morning air in the Hartzwalde grounds before taking leave of each other. Himmler, the butcher of Jews, walked side by side with Norbert Masur, the representative of the World Jewish Congress. Himmler said, "You know, if we had met ten years earlier, Herr Masur, this war would never have taken place!" Himmler then got into his car and set out with Schellenberg for Hohenlychen. 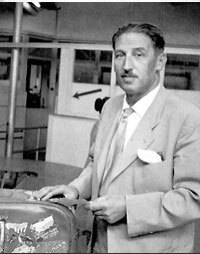 In the course of the next few days Dr. Brandt, who had remained at Hartzwalde, made out all the documents and handed Kersten and Masur the necessary permits and papers for the Jews about to be released. Dr. Brandt then retired to his room, where he and I discussed the events of that memorable day. Not long afterward-at about 11 A.M.-Kersten and Masur left Hartzwalde to return to Stockholm. Kersten was angry with me because I had been unwilling to misuse my astrological knowledge in order to promote his personal projects. He did not come to say good-bye. Kersten and Masur flew back to Stockholm via Copenhagen with good reason to be satisfied with their success. Heinrich Himmler had not hurt a hair of their heads. Kersten had been richly rewarded by Himmler for all the help and the physiotherapy which he had given him over the years. There were times when Schellenberg found it both embarrassing and disagreeable to obtain the large sums of money from his foreign exchange accounts and from the Reichsbank which Himmler then gave to Kersten. But Kersten knew nothing of these annoyances and would have thought nothing of them if he had. As far as he was concerned, the operation to secure the release of the Jews was a straightforward and profitable business deal in the great game of politics. 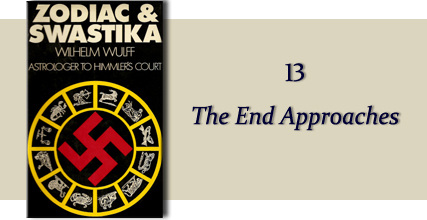 Nazis: The Occult Conspiracy: video concerning Wulff's influence upon Himmler. (Featured from timestamp 49 mins until end).